Photos from left to right courtesy of Just Jared, Gretyl Macalaster, and Marc Nozell. Apologies for not being able to resist the gratuitous shirtless Scott Brown pic. Given recent stories of New Hampshire GOP weariness regarding the now announced Scott Brown Senate bid, it's hard to believe there was a time when the pick-up truck driving, common-man type was a source of great Republican pride. After all, how could the establishment, or the Tea Party for that matter, begrudge the man who wrestled away the Senate seat held by liberal lion Ted Kennedy for five decades, in a state with a partisan bent like Massachusetts? But a stinging, if not anticipated loss to Elizabeth Warren and the Democratic presidential turnout machine in 2012, on top of less than inspiring polling numbers against his new Democratic opponent Jeanne Shaheen, have caused the former model/attorney to lose a bit of his luster. 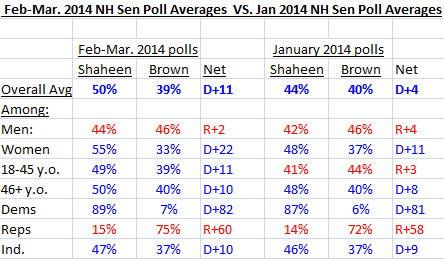 Most recent surveys of the 2014 Senate battle find Brown trailing Senator Shaheen by around 10-pts or more. However, he's got three other headaches to contend with beyond the simple fact he's losing. 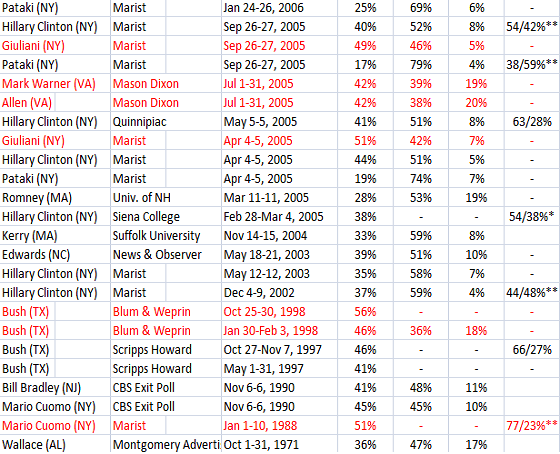 Polling used in the average can be found at Huffington Post's Pollster. Brown went from leading among New Hampshire voters aged 18-45 years old by three points in January, to trailing with this group by eleven points in February/March. He held Shaheen to an eleven point advantage among women in January, though her advantage has now doubled to twenty-two points. Brown's lead among men dropped, while Shaheen's lead with >46 year olds and Independents grew slightly. The only positive trend for Brown from January to February/March was his numbers among Republicans, which improved from January ever-so-slightly. The second headache for Brown? Not only is he trailing Shaheen, but he's WELL behind where his would-be Senate colleague, Kelly Ayotte (R) was polling at this point in 2010, and is failing to hit crucial markers reached by Mitt Romney in 2012. Granted, Brown has nearly impossibly large shoes to fill if he hopes to recreate Ayotte's landslide 60-37% victory over Paul Hodes (D) during the last Republican wave. 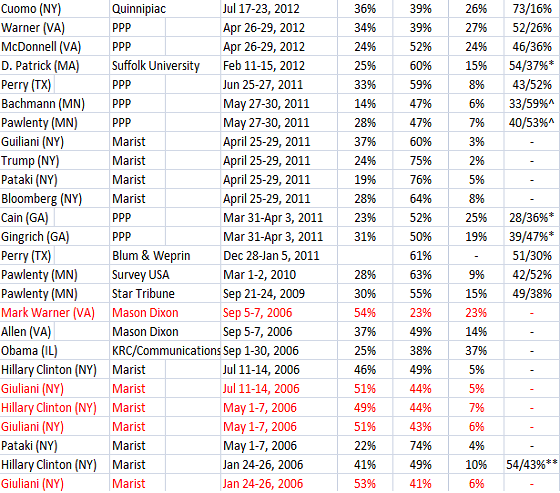 But for the record, she was leading Hodes by double-digits before the Spring of 2010. 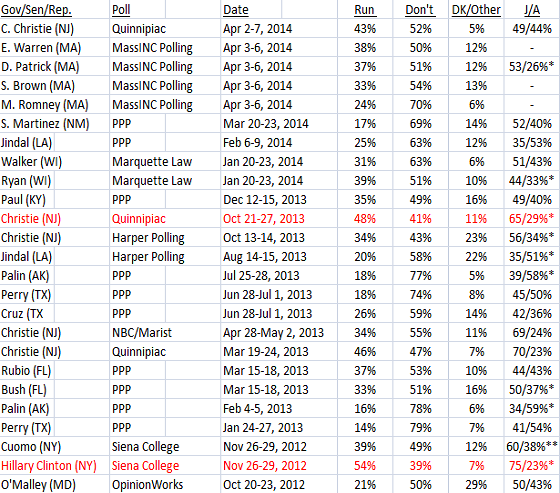 Brown hasn't led a poll against Shaheen yet, at least not according to the Huffington Post or Real Clear Politics. New York Governor Andrew Cuomo was wildly popular in his home state, according to a mid-2012 Quinnipiac University poll - to the tune of a 73/16% job approval rating. Despite all the local love, just 36% of registered New York voters wanted him to run for President in 2016, including only 44% in his own party. Thirty-nine percent of all voters did not want him to run. A second survey taken by Sienna College just after the 2012 Presidential election showed that while Cuomo's job approval rating had deteriorated to some degree, he remained quite popular. Yet still - New Yorkers weren't willing to jump on board for a 2016 run, opposing such a move by an even larger 49 - 39% margin. It seems as though Andrew has followed in his father, Mario's, footsteps in more ways than one. A 1990 CBS News Exit Poll found just 45% of New Yorkers felt the popular, 8 year governor would be a good President, while an equally large share felt he would not be. This apparent disconnect between a politician's home-state popularity, and the desire of their constituents to see them ascend to the presidency, doesn't end with New York voters. Governor Christie is in the same boat, even after his approval ratings shot through the roof in the aftermath of his apparently competent handling of Hurricane Sandy. Take, for example, a May 2013 NBC/Marist poll that found his statewide approval at 69%, with just 24% disapproving. Regardless, less than half of the number that approved of his job performance wanted him to run for President (34%), while a solid majority preferred he not run (55%). A Quinnipiac Poll from one month earlier had similar findings. Christie was again wildly popular (sporting a 70/23% job approval rating), while a slight plurality of New Jersey registered voters (47%) preferred he NOT run for President in 2016. And a six-month old Harper Polling survey, taken well before "Bridgegate" became a part of our political lexicon, found only 34% of New Jersey voters wanted Christie to run for President, while 43% would rather he didn't; this, despite a strong 56/34% favorability rating. Consider the table below, which compiles state-based polls on local support for home-state Senators or Governors running for an upcoming Presidential race in one chart. The far right column documents the politician's local job approval or favorability rating at the time of the poll (where the information is available). Entries highlighted in red indicate at least a plurality of state-voters were supportive of the particular candidate running for President. * denotes favorability, not job approval rating. **asks to rate the Governor/Senator's job performance as excellent, good, fair, or poor. ^Asks whether Pawlenty/Bachmann should run for POTUS, Sen, House, or No Office. 2010 Democratic nominee for Governor looks sternly at her opponent during that race. Her loss last night seems all the more surprising, given her status as a known commodity statewide, and Jolly's relative obscurity. Pic courtesy of Getty. Special thanks to Greg Giroux, whose work is cited frequently throughout the article. Last May, Democratic pollster Public Policy Polling caught a little flack for what more than a few observers considered a major polling miss in South Carolina's special election between Mark Sanford and Elizabeth Colbert-Busch. And though their single Florida Special House poll wasn't quite so bad, it wasn't good either. In a survey that was concluded Sunday, PPP also found that Democrat Alex Sink was carrying early voters 52-45%. Red Racing Horses found Sink leading by just 2 points with early voters, 48-46%. The actual final result among early voters? Sink by 2 points, or 48.5 - 46.2%. Score two for Red Racing Horses. Wendy Davis, as beloved by the liberal grassroots, Hollywood left, and abortion rights activists as she may be, doesn't seem all that poised to become the first Democrat to capture the Texas Governor's mansion since Ann Richards in 1990. In spite of an impressive fundraising presence, she's had a bumbling media presence, and poor poll numbers. After a close look at last night's primary results, it's doubtful anyone will be disabused of the notion that Davis is likely to lose to Abbott in the fall. With 99.9% of precincts reporting, Wendy Davis defeated her primary opposition in a two-person field with an undeniably impressive 79% of the vote (about 432,000 people). But the bright-spots stop there. She attracted less primary votes than three of the two Democratic Texas Gubernatorial nominees before her - Bill White in 2010 (517,000 votes), and Tony Sanchez in 2002 (609,000 votes). She outperformed the third only slightly, Chris Bell, in 2006 (325,000 votes). In fact, Davis's vote total was only a fraction of the woman's she no-doubt considers a hero, former Governor Ann Richardson (who attracted 807,000 votes in her primary for re-election 20 years ago). As bad as that sounds, it gets worse. Republican Greg Abbott also won his party's primary last night, but by an even more impressive 92%. That's a whopping 1.2+ million votes, by far the most of any Texas Gubernatorial Primary candidate, Republican or Democrat, ever. Yeah, yeah, I know what you're thinking. Texas is filled with Republicans, so obviously, Abbott's primary vote total is is going to be higher than Wendy's. True, but her vote total, as a percentage of the winner of the GOP primary's vote total, is lower than Bill White and Chris Bell's before her (Rick Perry ran unopposed in the 2002 GOP primary). Before going on to lose to Perry in the general election by 9-pts, Chris Bell (D) managed to win 59% of the total number of voters that Perry won on primary night, 2006 (553,000 votes). In 2010, Democrat Bill White won an even larger share of Perry's voters (68%) on primary night than Bell. He, too, went down in defeat to Perry that November, by 13-pts. What share of Greg Abbott's vote total did Wendy Davis win last night? A pretty paltry 35%. Yes, you read that correctly. Davis, in her primary, won just 35% of the total votes won by Greg Abbott in his. Obviously, variables like primary vote totals don't necessarily predict the outcome of a general election months down the road. These races aren't frozen in vacuums. They're fluid, and susceptible to any number of things, like the noise of the 24-hour news cycle. And look no further than 1994 for an example of when the bigger primary vote-getter did NOT go on to win the general election. ...but still. Thirty-five percent, and 432,000 votes? Is this even remotely impressive for someone of Wendy's rock-star status? More than that, what does it say of the Democrat's hopes of "turning Texas blue"?